Since I started writing for Examiner.com as a speculative fiction examiner, I’ve decided to start posting all my book reviews there. Because of editorial guidelines the reviews will be 400 words max, and written in third person. So quite different from how I normally write reviews. I think this will be good practice for me, learning how to write neater, more succinct reviews. Would be nice if examiner had a spell checker though. Also, I’ve heard that they’re a little iffy about how they pay their examiners, but it’s not like I make more money of this blog…yet. And since I’m going to be writing these reviews anyway, I might as well post them there. Who knows, maybe it will end up being worth it somehow. 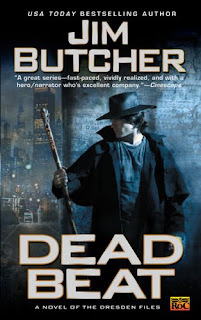 With that out of the way, head on over to check out my review of Dead Beat. And when you’re done with that, don’t forget to pick up your own copy from my amazon link here. My bookie would be most appreciative. So would my kneecaps.